The early 1650’s marked the beginning of the Society in an organised form. Seekers and others in the north of England were attracted by the preaching of George Fox and by his spiritual insights. Gradually the movement he inspired became an organised body. From early on the nickname, Quaker, was applied and has become an acceptable alternative for, Friend, the term often used by members of the Society themselves. The first Quaker meetings in Ireland, dating from 1654, was near Lurgan, with rapid spread throughout Ulster, Leinster and Munster, although Friends have never been numerous. The predecessors to this book go back a long time: a book of ‘Advices and Rules’ was agreed and published by Yearly Meeting – the main administrative body – of Friends in Ireland as early as 1811. Even prior to that it had existed in manuscript, consisting of extracts from documents issued by the authority of the Yearly Meeting. The 1811 edition was succeeded every few generations by further editions. From 1881, it was divided into two parts: Christian Discipline, currently available in the form, ‘Organisation and Christian Discipline’ and Christian Experience, now revised and published as this book, ‘Quaker Life and Practice’. While primarily a reservoir,a spiritual resource, for use by Friends, hopefully it will also be of general interest to the wider public. As it now stands, the book is in the nature of an anthology, made up of quotations from Scripture, and from writings of Quaker authorship spread over the centuries. These are interspersed with linking paragraphs written by the current and previous committees appointed by the Yearly Meeting to review the book. It should be said though, the books not a statement of doctrine, still less a creed: for Friends, words alone can never be the final declaration of divine truth. 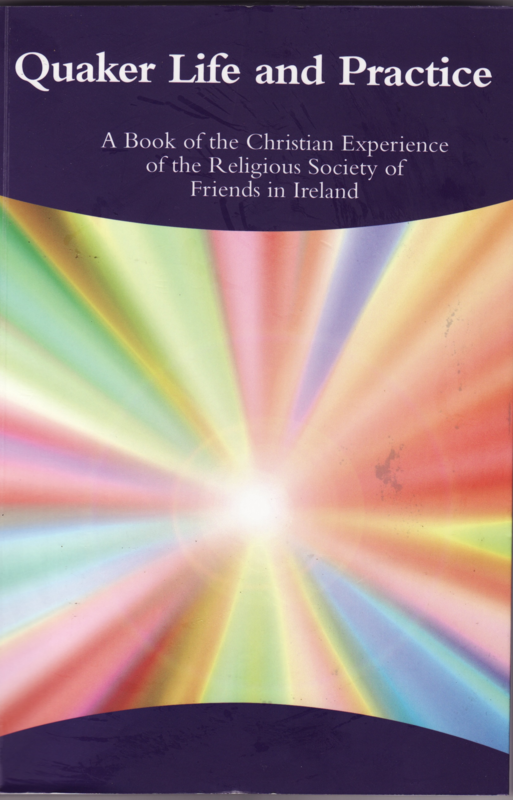 Quaker Life and Practice can be bought from the Office at Quaker House Dublin for €10. Post and packaging is extra.